A couple of months ago, I found myself wandering through one of my favorite shops...a great small-town store that has become a "must" anytime I'm nearby. Filled to the brim with everything vintage, primitive, antique, and retro, it's nothing short of fabulous! As much as it called to me, it really didn't "fit" into our style. Built in 1864, I've tried to fill our home with things that have a sense of history...old trunks, cupboards with wavy glass, spongeware dishes alongside yellowware bowls, spinning wheels, handmade quilts...you get the idea. As cute as this sign was, it just wouldn't work. An earlier post of mine was titled "Dream a Little Dream" and all about the search for a vintage camper. A search my teenage daughter began, and I was determined to help her. There's the story of the cutest little 10' Shasta compact camper that was the $100 find of the century! 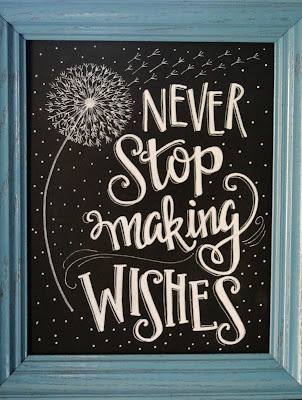 Not my find, of course, but one lucky gal had her wish come true. It was so...Tiny. Yellow. Adorable. I kept looking in the paper and reading online auctions. Nothing was right, or nearby, or simply nothing existed at all. Vintage campers and glamping had taken off like wildfire and I could find nothing. And so the search continued...for years. One day in March, I sat down to catch up on a friend's blog...I'd followed the progress on her 1963 Yellowstone camper for about 5 years. Freshly painted, with cheery fabric stitched into curtains and comfy seating, it was fun to look at the before and after snapshots. It's amazing what a little TLC can do! While reading her blog I blinked...what? "I have decided to let our little trailer find a new home." No pondering this time...I immediately commented, and then, just in case she didn't have time to check her blog, I sent an email. I knew that the camper was well-cared for and only about 15 minutes away. In no time Hubby and I looked it over, then brought along a friend who knows all the ins and outs of vintage campers. He suggested a rubber roof and a quick fix on the water line. And you know what? That sweet little 13 foot 1963 Yellowstone Cab-over camper is sitting in our driveway. 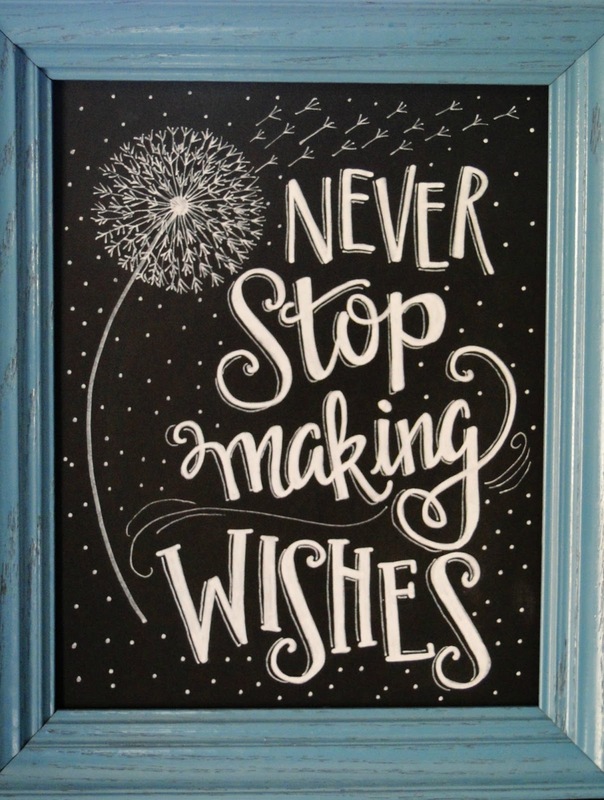 The first thing I did was unwrap and hang the picture telling me to "Never Stop Making Wishes." 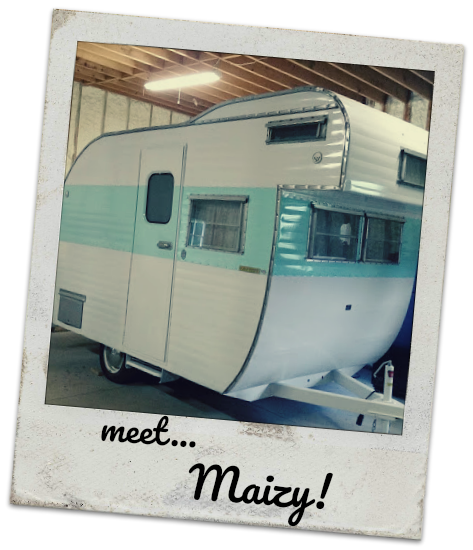 While the turquoise blue wasn't right for our home, it was perfect for a camper now named Maizy! I'm dressing her up with turquoise, cherry red and a bit of lightning-bug yellow...I'm having fun putting my own retro spin on her. And you know, for someone who loves antiques and primitives, who knew I had a surprising amount of vintage goodies tucked away just waiting for someday? When she's all "just right" I'll share some photos. Yes, a time for everything...and I can hardly wait to take her on the road with our family! ...being a traditionalist, I would enjoy a vintage trailer just the way it can off the line when new. I can't argue with that! Would loved to have seen her then. Maizy is wonderful! Thank you for sharing your story! Cheers! Thanks, Carole...it's been fun and something I never thought I'd find!